Beer Holding Tie - Moar Stuff - You don't need it but you know you want it. The Bev Tie – Beer Holding Tie is perfect for the professional drinker. It holds a bottle or a can conveniently around your neck so you hands are free for other activities (like eating) without actually putting down your beer. It’s perfect for parties, potlucks, tailgates, camping, kayaking, weddings, bachelor parties, and more! You will not only look classy (Hey! 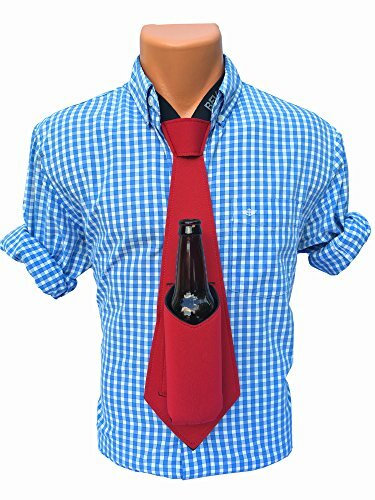 You’re wearing a tie, what else do they want) but, it also solves the perennial problem of finding someone to hold your beer before you do something crazy. 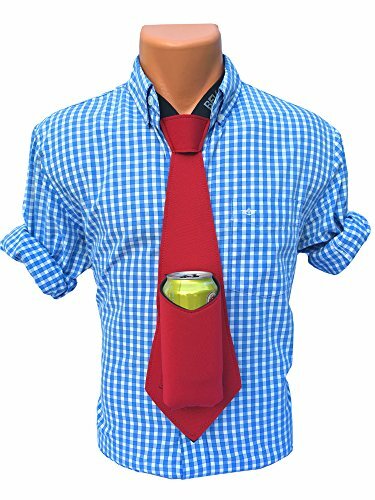 With the Bev Tie, you can hold your own beer and still have both hands free. Made from either blue or red Neoprene; it not only keeps your beer cold but, it will also keep any condensation off your shirt. It’s easy to use, just use the adjustable Velcro closure to fit it comfortably around your neck and stuff in your favorite brew. I suppose you could use it to hold soda or water as well but, it seems like a waste of a perfectly good Beer Holding Tie, doesn’t it? Dimensions: 16 x 5 x 3 inches. Adjustable Velcro structure so one size fits most. Made from Neoprene to help keep your beer cold. Not recommended for hot liquids, who would heat up beer, anyway? Yes, I know Germans would but, it’s usually just warm, not hot. I’ve had beer in Germany. It’s good.